For this month’s Nature News, local landholder Jane Rusden talks about the many animals, both feathered and furred, that use the bird baths at her bush block in Campbells Creek. This article was featured in the Midland Express on 7 February 2018. Birdbaths are very popular right now. Birdbaths are a win-win for both the native animals enjoying the water, which is so important in this blistering hot weather, and the humans that get to watch them. I have several sizes of bird baths in different locations on my bush block, suiting different species of birds and other animals. The pedestal bird bath with gently sloping edges is very popular with the small to medium sized bush birds. It’s so attractive because there are shrubs nearby that the birds can dart into if feeling threatened or unsure. Everything enjoys a drink as well as a good wash and swim: from all twelve White-winged Choughs in a family group trying to cram in at once, to tiny Striated Thornbills. Surprisingly, the Yellow-footed Antechinus also favours this bath, with the vertical pedestal and the underside of the concrete bowl no obstacle to their agility. On the ground there is a ceramic birdbath, with gently sloping sides to provide a gradient of water depth, and a small shrub or two nearby. It is preferred by the ground foraging Common Bronzewing, but Crimson Rosellas, Brown-headed and Yellow-faced Honeyeaters use it for drinking and swimming as well. 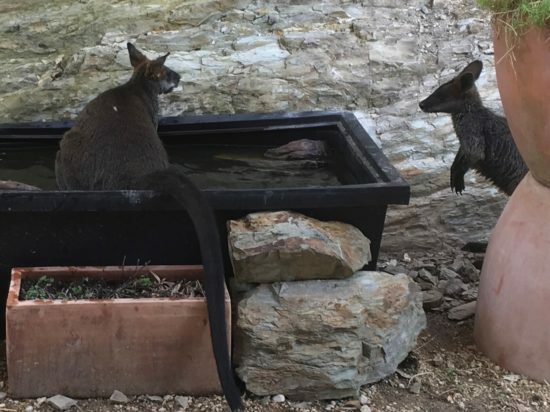 All the waterweed in the trough has been eaten by the hungry wallabies! Photo by Jane Rusden. The deeper cattle trough in the shady courtyard is frequently visited by the echidna, who enjoys a long drink by sticking its nose in up to its eyes and blowing bubbles. In this extremely hot weather, Magpies and Fuscous Honeyeaters will stop by for a drink and a rest in the cool, while the wallabies have taken to jumping right in and sitting there while they cool down and drink at the same time. We don’t have a TV, but don’t wish for one, as we can spend hours watching the local wildlife use the different birdbaths in their own unique way. We have similar success with out water sources- including the dams. Could you post photos of your bird baths to give us some idea of other shapes and sizes of receptacles to place around the property? Hi Jill, this article was written by one of our landholders Jane Rusden. Jane has many different bird baths – the trough as pictured, then a traditional pedestal bird bath as you would find at a hardware store or garden supply place. A deep bath on the ground is also a good idea, and a shallow bath mid-height. You are only limited by your imagination and access to a water source such as the garden hose.